Shop our range of dog supplements. Joint supplements for dogs, flea treatment for dogs, calming tablets for dogs, dog teeth cleaning and our dog urine grass spot prevention remedy, Green Peez plus much more. Handpicked natural products which you won't find on the High Street. Welcome to the home of natural health for dogs. 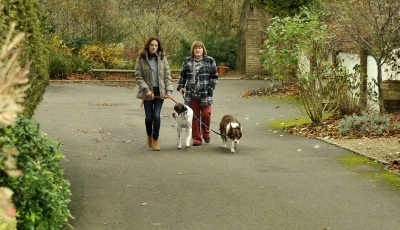 Frances Gavin founded Canine Natural Cures in 1988 and is pictured with daughter, Aisling Armitage, walking their dogs. Frances and Aisling work closely together to offer dog owners a natural solution to many common problems. Frances has a long history of working with dogs and established the company in 1988 when seeking natural remedies for her own German Shepherd who suffered from epilepsy and multiple food intolerances. Whilst sadly Pearl passed away, Frances continued to develop her interest in this field. Canine Natural Cures was one of the first companies in the UK to offer an holistic approach especially for dogs. Today, Canine Natural Cures still provides this holistic approach to a wide range of conditions from itchy skin, tear stains, joint support and oral care to dealing with behavioural issues, aggression and coping with stress.